The SHARING Clinic opened on September 9, 1997 in order to provide primary health care to underprivileged populations in South Omaha. It began as a medical student's vision of the need for quality care among Omaha's underserved. With the help of a small group of medical and nursing students under the guidance of Jim Medder, a family physician, and Kathryn Fiandt, a nurse practitioner, the clinic was born. Some of the initial barriers included finding a location, raising money to pay a social worker, collecting pharmaceuticals, finding volunteer physicians, lab techs, and nurses, and recruiting and educating students to run the clinic. The SHARING Clinic operated out of the South Omaha Neighborhood Association (SONA) clinic until February of 2006 when the clinic moved to the UNMC Community Health Center at 36th and 'Q' Streets in South Omaha. 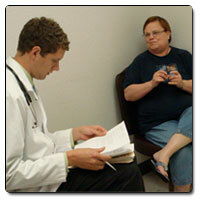 In January 2011, the Clinic relocated again to the Specialty Care Center. The SHARING clinic operates on Tuesday nights from 5:30-7:00 PM at the Specialty Care Center located at 52nd & Leavenworth streets in midtown Omaha. For more information or to make an appointment at the SHARING Clinic, please call 402-559-2666.